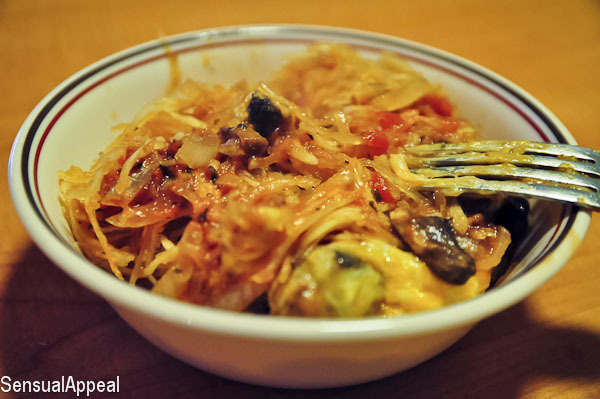 Curious about the health benefits of spaghetti squash? 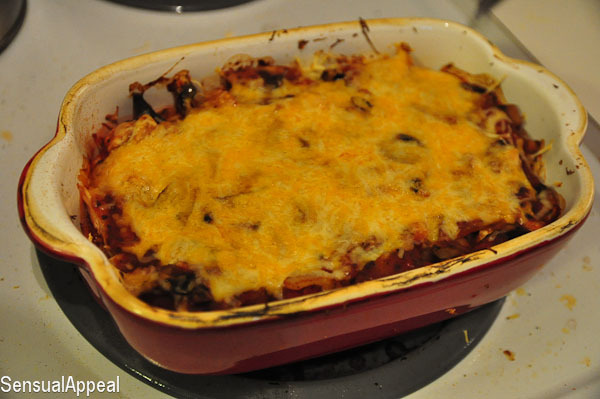 Check out the benefits and how my first adventure went with this lovely veggie in this post. I purchased spaghetti squash after seeing numerous recipes on blogs using it. I had no idea what to expect. What it would taste like. Whether I would like spaghetti squash.. no idea. But no way for me to form my own opinion if not by buying it and making it, right? So I did! It sat on the counter for about a week… or maybe two… until finally, I decided to make something of it. While I had a bunch of recipes saved and pinned that used spaghetti squash my silly brain decided not to use any of those but rather to just go with the flow. I did what I remembered from them and just went for it. First, I poked some holes in it and tried to cut it in half to cook in the microwave. It didn’t go all the way through… the knife got stuck! Finally after getting it out, I stuck it in the microwave for 2 or 3 minutes to cook. Then I tried to cut it again and finally after a whole lot some difficulties, I managed to cut it in half. Kinda. So I got all the seeds out and stuck it in the microwave again for another 2 minutes. Then I saw it was pretty warm and I was afraid it would explode… especially since I didn’t remember how long I was supposed to put it in for. Why didn’t I use Google for this? No idea. So I took it out, attempted to scraped the “noodles” out and stuck it in a preheated oven at 350F. By the way, while I was doing the scraping, the smell of the spaghetti squash was filling the air. It made me think of pumpkin soup that my mom makes, which is the best soup like ever. It’s my favorite soup, it’s sweet and creamy and… anyway, this isn’t a post about pumpkins, oops. So yeah, upon smelling this, I wanted to add whipped cream and eat it straight! haha yeah, weirdo. But I didn’t. So I put it in the oven at 350F to help it warm up more. Then eventually I added sauce and baked it longer . Then it was time to eat. Did I expect it to taste like noodles? No. Did it taste like noodles? No. Did I want it to taste like noodles? Actually, no, I didn’t. Because I’m not a big starch/noodle/pasta fan anyway! The spaghetti squash took the flavor of the sauce and didn’t have much of a flavor on itself because my spaghetti sauce was overpowering which was okay with me. With Ketchup and Mustard? Why the heck not! Will I make spaghetti squash again? Absolutely. Even though I kind of played it by ear, I really enjoyed this as a dish, it was yummy and especially delicious microwaved the day after (all of the flavors got all soaked through, I think). Next time though, I will follow bloggers’ recipe directions and make an actual premeditated recipe. I know there are some things I didn’t do correctly and I’m pretty sure the outcome will be a lot more satisfying once I do it the correct way. So yeah, awesome dinner, over all. Of course nutritional yeast flakes HAD to be added (they are so yummy). I’m going to end with some nutritional facts about spaghetti squash…. One unsalted cup of spaghetti squash contains: 42 calories, no fat, 10g carbs, 4g sugar, 1g protein, 2.2g fiber. Spaghetti squash has a high water content and is not as dense in vitamins and minerals as other winter squash, such as acorn or butternut, but does provide 3 percent of the Daily Value for calcium, 5 percent of the DV for Vitamin A, 9 percent of the DV for Vitamin C and 8 percent of the DV for dietary fiber. Spaghetti squash supplies modest amounts of carotenoids, plant substances that the body turns into Vitamin A and that may help protect against some diseases. Spaghetti squash contains omega-3 essential fatty acids and omega-6 fatty acids.While the former is good for preventing heart disease, cancer and inflammation caused by arthritis, the latter promotes brain function. It contains various vitamins and minerals, which are required for proper functioning of the body. Spaghetti squash is apparently also good for prostate health and it can also be used for treating benign prostate enlargement. It is very rich in beta carotene, which can prevent atherosclerosis and is also beneficial for people with insulin resistance. Spaghetti squash is a good source of vitamin A and vitamin C that are antioxidants, which can prevent cell damage. The B vitamins in spaghetti promote proper cellular function. 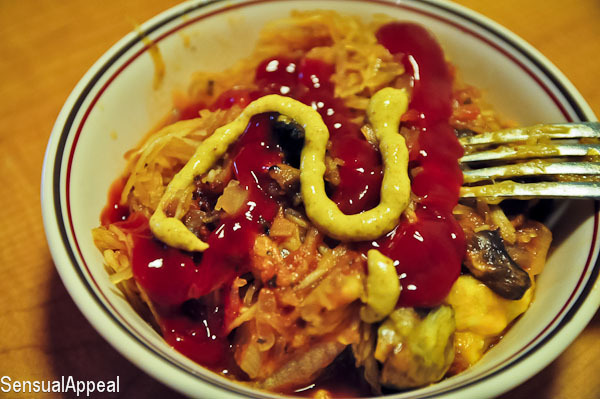 What’s your favorite way to eat spaghetti squash? Links welcome. I’ve had spaghetti squash before and while it was okay (I’d certainly eat it again if it were being offered somewhere) it didn’t wow me and so, paired with the hassle of preparation, I’m just not enough of a fan of it to really go out of my way to try it again. I can’t buy them in the UK and I’ve always wanted to try a recipe ! Your attempts look great..and it looks like a yummy dinner! I absolutely love spaghetti squash, I make it at least once a week. So easy to make and so much you can do with it. Wow the nutritional stats sound pretty good… I don’t think I can get it in Australia though unfortunately. I recently bought miracle noodles and I am going to give them a try. I have found spaghetti vegetable in Sydney, I now have the seeds and will probably plant them as thry are hard to find. I actually tried spaghetti squash a few months ago and acutally ate it like spaghetti instead of the noodles and really enjoyed it. It was a bit expensive I thought though so I haven’t bought it again. But definitely need to try other recipes. I’ve always wanted to try spaghetti squash but haven’t. After reading your post, I’m going to try one this year since they will be in season here in about a month and I’ve been trying out a new ingredient or spice in my cooking once a week. I am on sort ofa heal th kick lately and boughtth is on the spur of the moment. It too sat in my kitchen about a week or so until i came home late from work one night and thou ght what on earth am I going to do with it? So hhere’s what I did- threw it in the microwave for 4 minutes to soften it up then put it in the oven at 350 for 30 minutes. AAfter it was done I scraped every thing out and separated the seeds (to roast up separately) tossed the squash in a pan with salt, garlic, butter and fresh parsley for about 5 minutes then tossed in some cooked shrimp and let it cook (over medium heat the whole time) for about another minute just un til the shrimp was heated through. Put a bit of parmigeon cheese on top and served. It was awesome. Although I do love my pasta i really enjoyed this. It wasn’t heavy but it was filling.